A former Bosnian Croat general died in a Dutch hospital on Wednesday shortly after drinking a liquid in a courtroom where judges had just confirmed his 20-year sentence for war crimes. 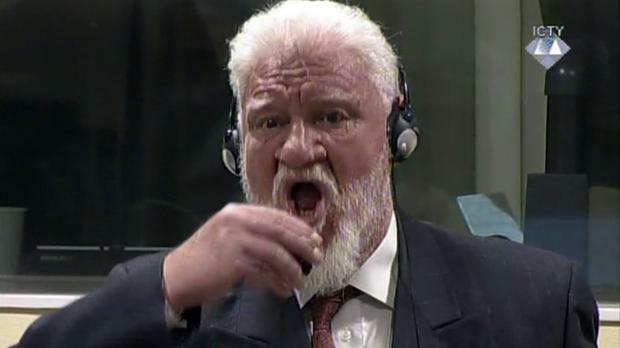 Slobodan Praljak, 72, claimed to have drunk poison from a bottle shortly after appeal judges confirmed his jail term for involvement in a campaign to drive Muslims out of a would-be Bosnian Croat ministate in Bosnia in the early 1990s. Nenad Golcevski, a spokesman for the UN International Criminal Tribunal for the former Yugoslavia (ICTY), said Praljak died despite efforts to save him. Mr Golcevski said: "Mr Praljak drank a liquid while in court and quickly fell ill.
"The ICTY medical staff immediately assisted Mr Praljak. "Simultaneously, an ambulance was summoned. Mr Praljak was transported to a nearby hospital to receive further medical assistance, where he passed." Commenting on the incident, Croatian PM Andrej Plenkovic told reporters "we have all unfortunately witnessed his act by which he took his own life". Mr Plenkovic said Praljak's action reflects the "deep moral injustice" done to six Bosnian Croats whose guilty verdicts were upheld by the UN's war crimes court in the Hague.